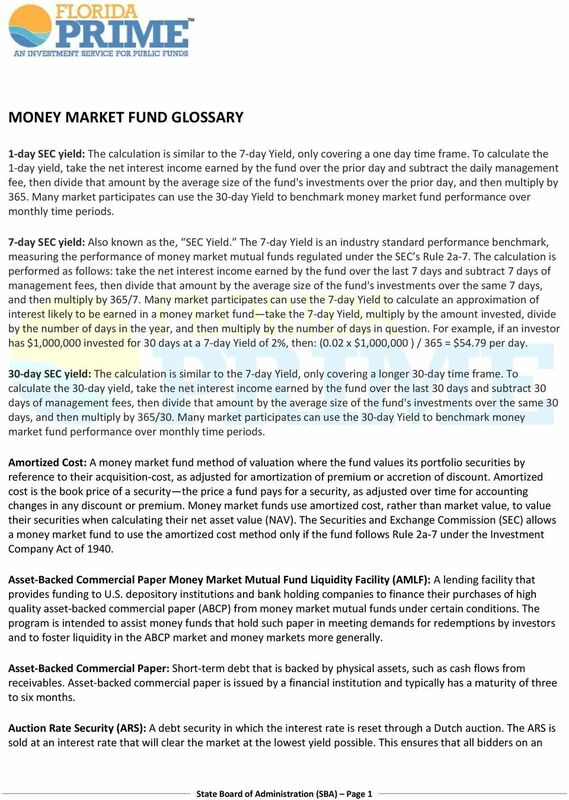 Download "MONEY MARKET FUND GLOSSARY"
Bonds, in the most generic sense, are issued with three essential components. 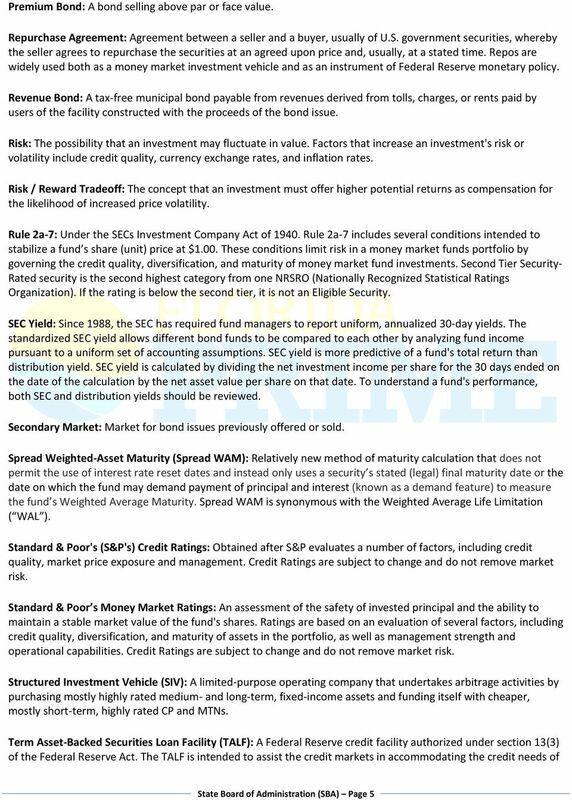 Chapter 13 Investing in Bonds 13.1 Evaluating Bonds 13.2 Buying and Selling Bonds 2010 South-Western, Cengage Learning Standards Standard 4.0 Investigate opportunities available for saving and investing. 1. 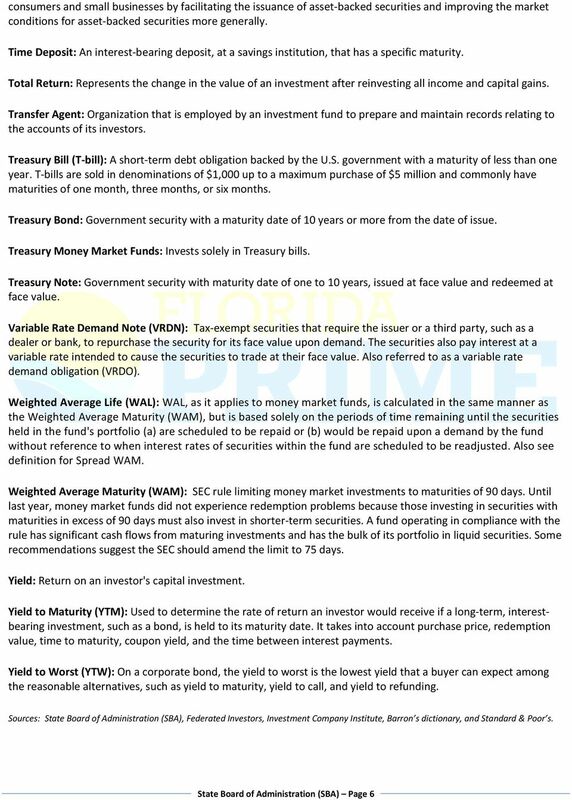 General Obligation Bonds (G.O.s): Bonds backed by the full taxing power of the issuer. 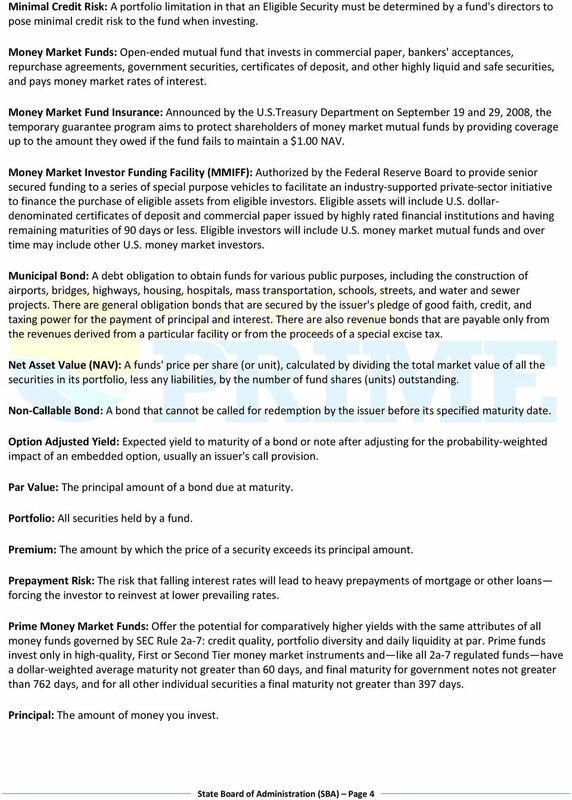 An U.S. GOVERNMENT SECURITIES Investor s MUNICIPAL BONDS Guide to MORTGAGE-BACKED SECURITIES Bond CORPORATE BONDS Basics FEDERAL AGENCY SECURITIES table of contents WHAT ARE BONDS? 1 WHY INVEST IN BONDS? Maturity The date where the issuer must return the principal or the face value to the investor. 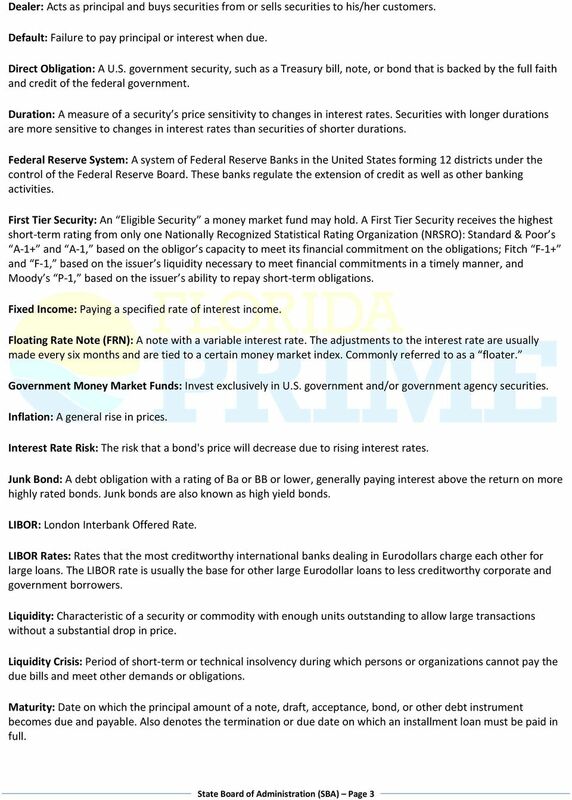 Managing Interest Rate Risk in Your Bond Holdings THE RIGHT STRATEGY MAY HELP FIXED INCOME PORTFOLIOS DURING PERIODS OF RISING INTEREST RATES. With interest rates at historically low levels, and the U.S.
1. The Program serves as an investment function to enhance portfolio return without interfering with overall portfolio strategy. [LOGO] ALLIANCEBERNSTEIN VARIABLE PRODUCTS SERIES FUND, INC.
http://www.investopedia.com/university/bonds/ Thanks very much for downloading the printable version of this tutorial. 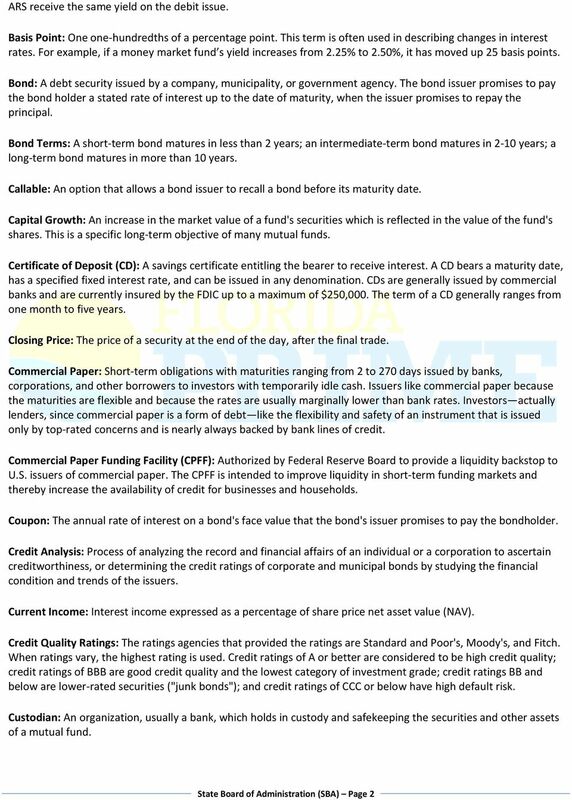 Investing in Bonds Page 1 INVESTING IN BONDS WHEN BUYING A BOND, YOU ARE LOANING MONEY TO A BOND ISSUER IN NEED OF CASH TO FINANCE A VENTURE OR FUND A PROGRAM, SUCH AS A CORPORATION OR GOVERNMENT AGENCY. FLOATING RATE BANK LOANS: A BREAK FROM TRADITION FOR INCOME-SEEKING INVESTORS. Why does the bank loan sector remain so attractive?